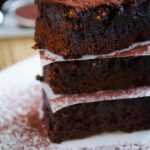 Red Wine Chocolate Brownies are the best fudgy brownies I’ve made with a surprising flavor. Taste Buds satisfaction guaranteed! 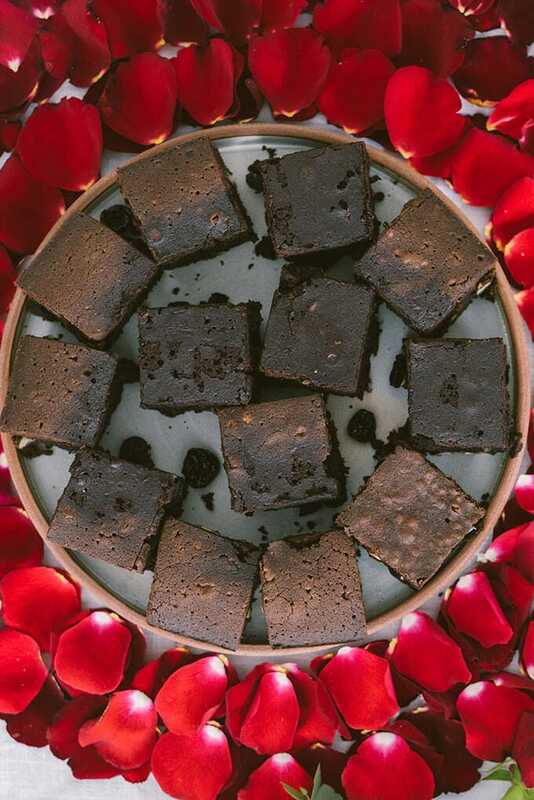 It won’t be wrong to say that this is a show stopping brownie recipe. 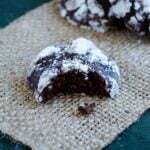 It has the perfect combination of two irresistible flavors: Chocolate and red wine. Nothing can go wrong with these two. 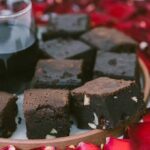 If you are inviting your love for dinner but haven’t decided yet what to serve as a dessert, make these Red Wine Chocolate Brownies. 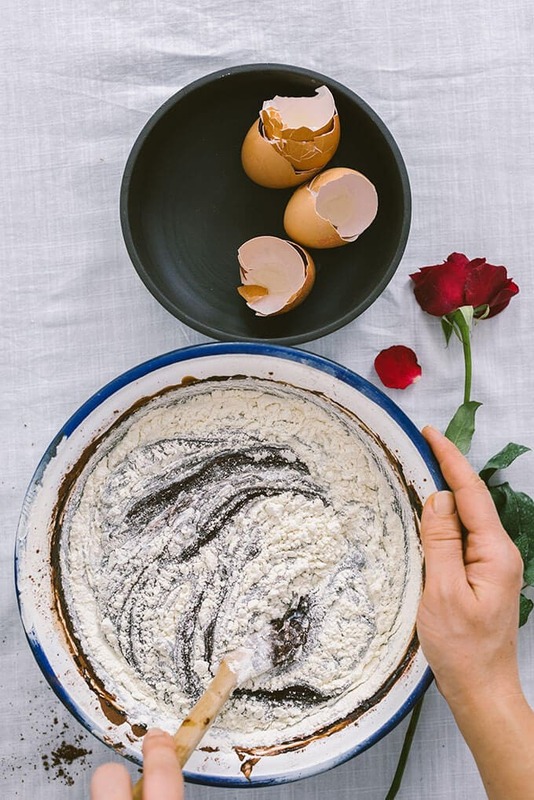 I guarantee everyone is over the moon once they get a bite from this unforgettable dessert. 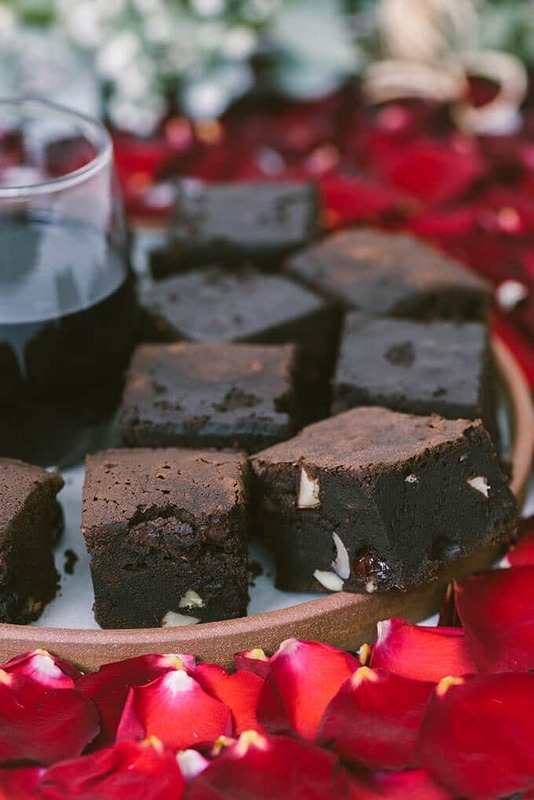 The wine flavor in these red wine chocolate brownies is not too much; just as much as needed. 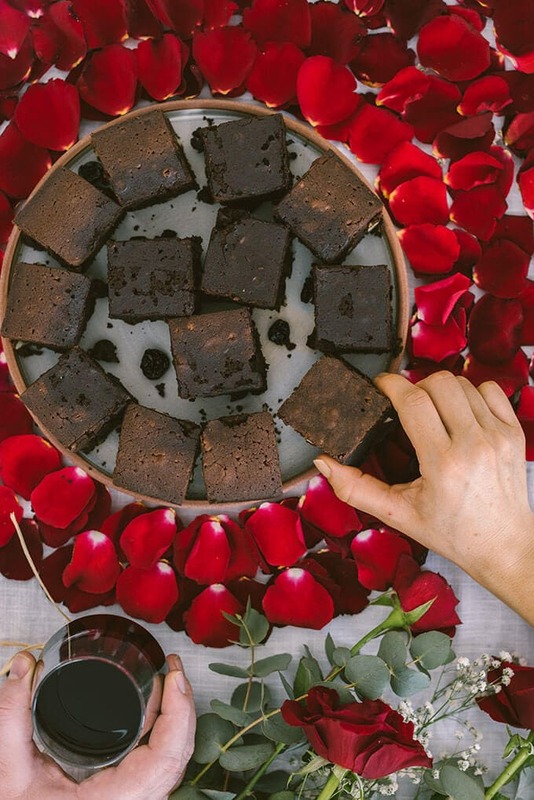 I love the smell of these red wine chocolate brownies as much as their taste. Red wine is even more noticeable when you smell them. I knew I’d try it when I first saw Amanda’s Red Wine Brownies Recipe with Drunken Cranberries. Who wouldn’t be intrigued by this name? I had never used red wine in baking before I gave her recipe a try, so I was extremely excited. And maybe a bit nervous too. Any ideas how I managed my feelings and stayed focused on the brownies I was making? I needed to check the amount of red wine in the recipe. Less than a cup. What would be the rest of that bottle? I mean I couldn’t have wasted the leftover wine. The result: It was a wonderful drinking and baking experience for me as I ended up with the richest and fudgiest brownies ever. I’m sure you’ve heard several times that baking is a great therapy. How about baking with red wine? You need to give it a try to see how it turns out. You will fall in love with the smell filling in your house when it is in the oven. What I love the most about Amanda’s recipe is soaking dried cranberries (or cherries in my recipe) in red wine. This makes the biggest surprise. You notice the wine flavor better when you have those drunken berries in your mouth. I made a few small changes to the original recipe at Amanda’s amazing blog A Cookie Named Desire and they still turned out perfect. Thank you Amanda! I made two batches of these brownies on the same day so that I could decide on the baking duration. I followed the original recipe in my first try and found that my brownies got a bit dry, so I shortened the baking time in my second try. I love my brownies fudgy, so I baked my second Red Wine Chocolate Brownies about 20 minutes shorter than suggested in the original recipe. You need to wait until it cools completely before slicing. These taste even better the next day. Heat red wine for a few minutes until warm. Remove from heat, add in dried cherries and let them sit for 30 minutes. Preheat oven to 350F (175C). Grease a 8X8 inch pan and line with parchment paper. Set aside. Melt butter in a saucepan. 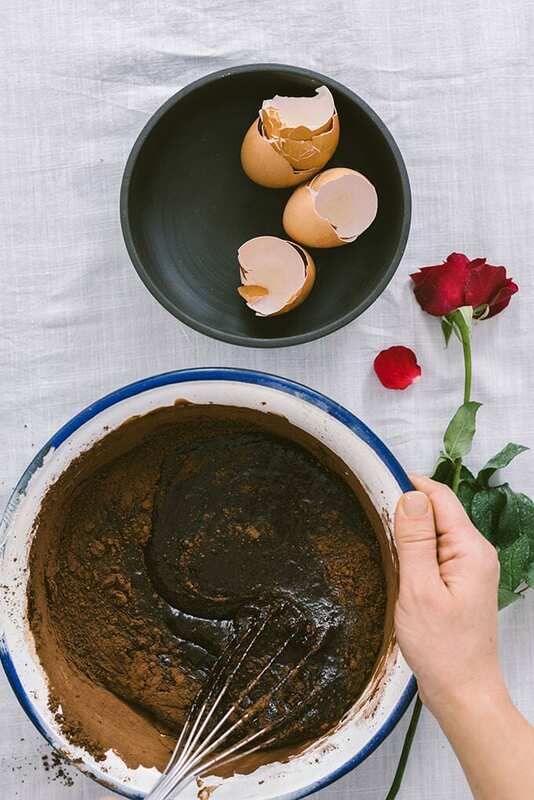 Remove from heat and add in chocolate when it’s still hot, whisking continually until smooth. Let it cool. Pour the melted butter and chocolate mixture in a large bowl. Beat in the eggs one at a time. Add in the sugar. Mix well. Stir in the cocoa powder and mix. In a medium bowl, whisk together flour and salt. Sift this in the wet mixture and mix until combined. Don’t overmix. Mix in the red wine and dried cherries. Fold in almonds. Pour the mixture into the prepared pan and bake for 30-35 minutes. An inserted toothpick comes out dirty but the center of the pan no longer jiggles. Let it cool in the pan about 15-20 minutes, then remove and let it cool completely before slicing. 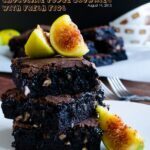 I have already seen a gazillion of brownie recipes but never ever with wine! Such a great idea. 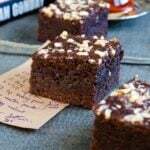 The brownies look really amazing. Thank you Adina! These are unbelievable! You must give it a try.